The Wemo® Mini Smart Plug, F7C063 now supports Apple® HomeKit™ which means you can now control your Wemo Mini using the Apple Home app. 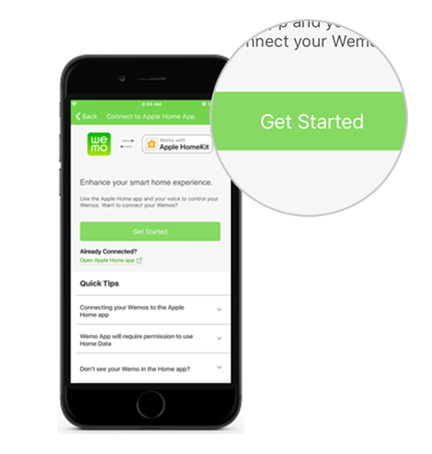 This article will guide you on connecting your Wemo Mini to the Apple Home app. 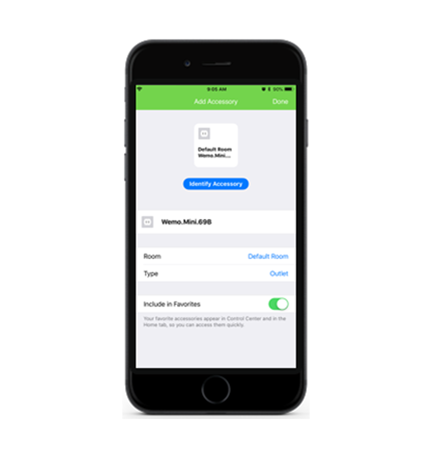 Your iOS device must be connected to the same Wi-Fi as your Wemo Mini to do the initial connection with the Apple Home app. Determine if you have 1st or 2nd gen Wemo Mini. Does your Wemo Mini have a HomeKit code sticker on the back? Do I need latest Wemo App? Yes, the Wemo App is required for initial setup. Optional, if you will be using the Apple Home app to manage your Wemo Mini. However, in order to receive firmware updates, the Wemo App is required. Download latest Apple Home app Yes, required if you will be using the Apple Home to manage the Wemo Mini. Yes, required if you will be using the Apple Home to manage the Wemo Mini. Do I need to enable Home Data permission for the Wemo App? Yes, required for the Apple Home app. To know how, click here. Yes, required for the Apple Home app. To know how, click here. Can I use the Apple Home app to do the initial setup? No. You must use the Wemo App first to set it up and then you can connect it to the Apple Home app. To set it up first, click here. Yes. You can add it as an accessory. This will include setup and connecting it to the Apple Home app. Do I need a firmware update that supports Apple HomeKit? Yes. Your Wemo Mini should have a firmware version of 2.00.11143 or later. The Wemo App will prompt you if you need a firmware update. No. The 2nd gen Wemo Mini supports Apple HomeKit right out of the box. These steps apply to both 1st and 2nd gen Wemo Mini. Step 1: Launch the App. Step 2: Go to the More tab and select Connect to Apple Home App. Tap on Get Started. NOTE: If a pop-up message appears saying Wemo Would Llike to Access Your Home Data, select OK. Step 3: Tap on Get Started. 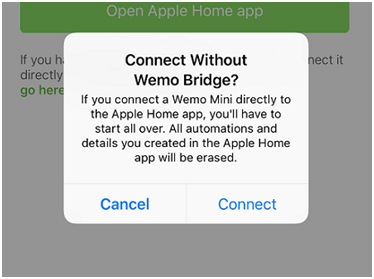 NOTE: If you have a Wemo Bridge on the same Wi-Fi and your Wemo Mini was associated to it via the Apple Home app, the Wemo App will automatically detect the Wemo Bridge. 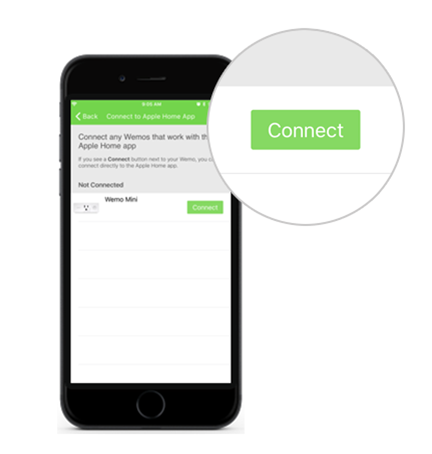 You will have the option to disconnect the Wemo Mini from the Wemo Bridge and manage the Wemo Mini on its own using the Apple Home app by tapping on go here. This will directly connect your Wemo Mini with the Apple Home app. If you connect a Wemo Mini directly to the Apple Home app, you’ll have to reconfigure any settings on the Wemo Mini with the Apple Home app. All automations and details you previously created for the Wemo Mini in the Apple Home app will be erased. 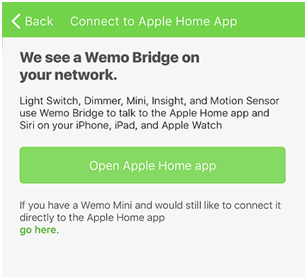 If you would like to leave your Wemo Mini connected to the Apple Home app through the Wemo Bridge, just tap Open Apple Home app then select Connect. Step 4: Tap the Connect button beside the Wemo Mini you want to connect to the Apple Home app then tap Continue. 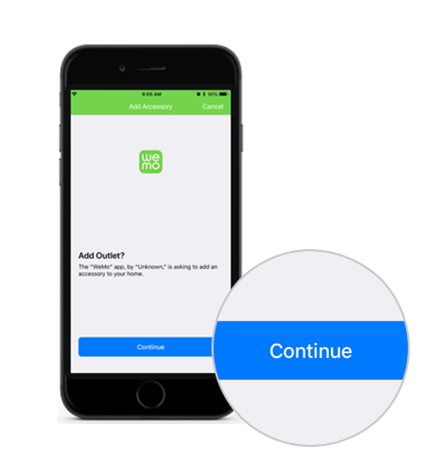 Step 5: You can retain the existing name of your Wemo Mini as what your Wemo App was using or you can change it by tapping on the device’s name. You can also change this at anytime later. Step 6: Tap Done. Your Wemo Mini will be listed under the Connected section. You have successfully connected your Wemo Mini to the Apple Home app. If you have more Wemo Mini to add, just go back to the Wemo App and tap Connect for the remaining Wemo Mini and repeat the steps. You can now manage your Wemo Mini with the Apple Home app. These steps only apply for the 2nd gen Wemo Mini. You may need to write down the HomeKit code located on the back of the Wemo Mini if you are unable to scan the code during adding the accessory. Step 1: Open the Apple Home app . Step 2: Tap the icon and choose Add Accessory. Step 3: Use the camera to scan the code located on the back of the Wemo Mini. You can also enter the code manually by tapping on the Don't Have a Code or Can't Scan? link. Do not unplug the Wemo Mini during this step as setup will fail. Step 4: You can personalize your newly-connected Wemo Mini's name, Room, Type, etc. When you're finished, tap Done. Your Wemo Mini is now connected to your Apple Home app. You can also open the Wemo App and it’s ready to use.